I know, I know — every day is a party with an accordion in the house. But the time eventually comes for this free-reed celebration to leave the crowds of hundreds and move to the kitchen, to delight no more than a dozen or so family members and neighbours at a time. Happily, that time will not yet be quite upon us until the 17th! In the meantime, we reconvene with old friends and new for one last time to bring our spirits gently back down to the real world after two days in the accordion heavens, preparing ourselves emotionally for another twelve months of having to settle for weekly radio updates, monthly get-togethers and such meagre local accordion concerts as are produced by other organizations. In the meantime, let’s go out on a high note! A Cavalcade of Salmon Avalanche: Over the past six years, the tireless Katheryn Petersen (katherynpetersen.com) has done everything for this festival except play music — which was really burying the lede, since as VCC’s first graduate in accordion studies, she has a mighty backlog of magnificent musical wisdoms just lying in wait for the opportunity to drop on us! We felt that flipping that equation on its head would be a more fair way to go about things this year, acknowledging and celebrating her long contributions to our festival by devoting a healthy slice of stage time to her and her selection of choice musical collaborators, from Teapot in the Tuba to Lindy Gray. 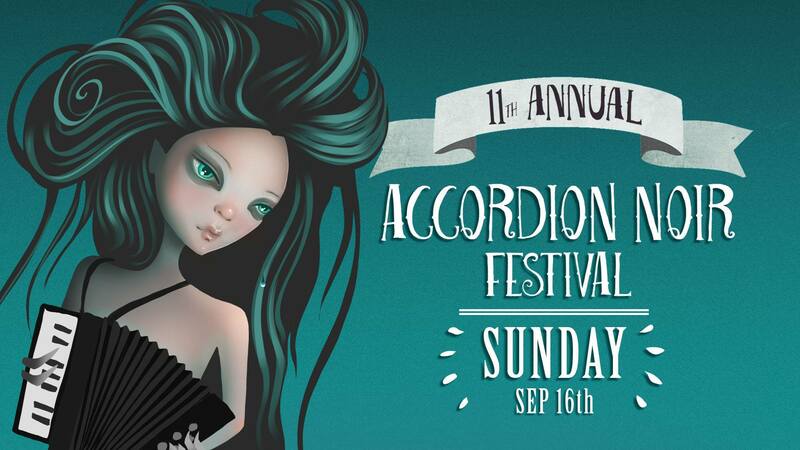 You will no doubt remember Basilissa (basilissa.ca) from their set at this summer’s Accordion Noir stage at Car-Free Main Street — or if not there, surely their stint at the Jazz festival left an impression! Either way, we are thrilled to once again have an opportunity to share with you the bittersweet fado-infused musical stylings of this Portuguese ensemble. From Alberta to France to Sweden to Spain and now back to BC again, the peregrinations of Wendy McNeill (wendymcneill.com) mirror in a way the travels of the accordion itself, picking up strange and delightful new tricks and inflections with every new territory it passed through. She has a new album you may not have heard yet, “Hunger Made You Brave”, and hopefully this festival appearance will set that omission straight.